Garnets are most recognizable in their famous pomegranate red, but this gemstone can actually be found in nearly every color. A favorite of connoisseurs who can't resist adding new and different garnets to their collection, these stones provide remarkable variety. There are garnets that change color depending on the light, translucent green garnets that look like jade, and garnets that look like they have stars inside them. 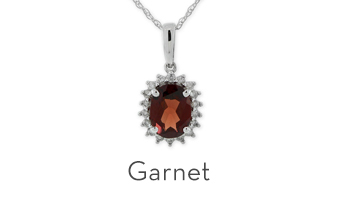 In general, garnets are durable, natural, and generally affordable. Royal purple amethyst comes in a variety of sizes and shapes and has a wide tonal range, from pale lavender to dark purple. This affordable stone was once as expensive as rubies until large amounts of amethysts were found in Brazil during the 19th century. 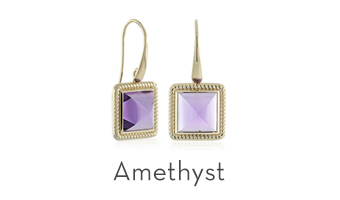 Amethyst's purple complements both warm and cool colors, so it is often set in both yellow and white metals. 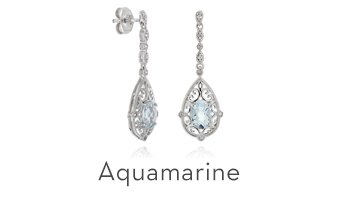 A gem whose name means "sea water", aquamarine captures the beauty of the sea. This member of the beryl family, which also includes emeralds, is found in a range of pastel blue and greenish blue shades. Historically said to calm waves and keep sailors safe at sea, aquamarine crystals are naturally large, which gives jewelers a lot of options when turning the original stones into finished jewelry. 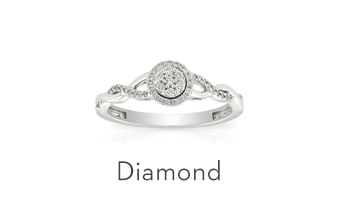 So brilliant they were once thought to be fallen stars, diamonds are considered one of the earth's most beautiful pieces of art. One of the hardest substances on the planet, diamonds form under extremely high temperature and pressure‐‐conditions that are only found around 100 miles below the earth's surface. Colorless diamonds have traditionally been the most valued and remain the most popular diamonds today, but fancy‐colored diamonds are currently enjoying a surge of popularity. These colorful diamonds come in a wide range of hues including blue, green, pink, red, purple, orange, and yellow. 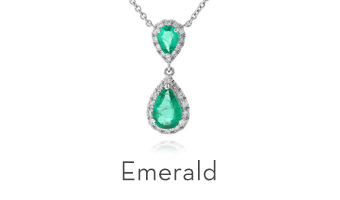 Emeralds have long been favored by powerful women, ranging from Cleopatra to Elizabeth Taylor. This rich, green stone is most often cut in a rectangular step‐cut, which is now popularly known as the emerald cut. Experts often differ, however, in determining the exact color line that separates an emerald from the less‐expensive green beryl. Identical in everything other than color, emeralds that are considered too light are classified as green beryls. Pearls have a unique place in the gemological world: they are the only gem that comes from a living creature. Also unlike other gemstones, pearls require no faceting or polishing. 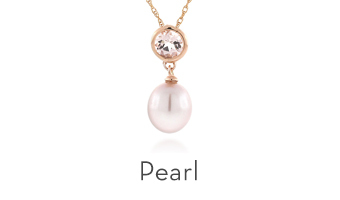 Perhaps best known for their luminous white and cream colors, pearls actually come in a wide variety of colors and form around a microscopic irritant (naturally occurring in natural pearls or deliberately inserted in cultured pearls) in the bodies of certain oysters. Pearls are often associated with their most famous admirers including Jacqueline Kennedy Onassis, Princess Grace Kelly, and Audrey Hepburn. Throughout history, rubies have been the world's most valued (and expensive) colored stone. In ancient sanskrit, in fact, rubies are called "ratnaraj" which means "king of precious stones". Rubies are formed by the mineral corundum which, in its most pure state, is actually colorless. 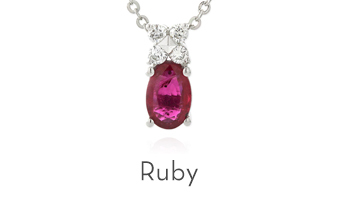 Trace elements of chromium that make their way into the corundum are responsible for creating rubies' deep red color. 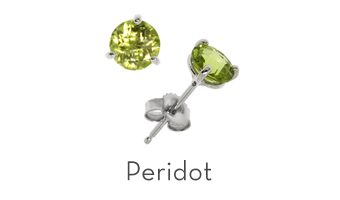 Peridot is recognizable by its lime green color. This fresh spring‐like stone, however, is the result of seriously extreme conditions: peridot is found in lava, in deep rocks from the earth's mantle, and even in meteorites that fall to earth. A few samples of extraterrestrial peridot have actually even been faceted into gems. 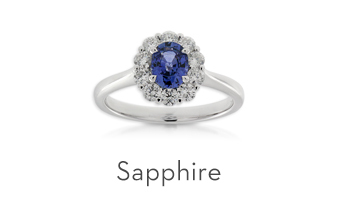 Sapphires have been known throughout history for their deep blue color. The ancient Persians believed that the earth rests on a giant sapphire whose reflection made the sky blue. Kate Middleton's royal blue engagement ring is another, more modern example. But, surprisingly, sapphires don't have to be blue. They actually come in a variety of beautiful pinks, yellows, oranges, peaches, and violets. One most sought‐after colors of sapphire is the rare and beautiful padparadscha, a pink‐orange stone whose color is reminiscent of a tropical sunset. Opals are known for their magical flashes of colors. Considered the most precious and powerful gemstone by the Romans and thought to contain thunder and lightening by the Bedouins, opals come in a wide variety of colors and patterns. 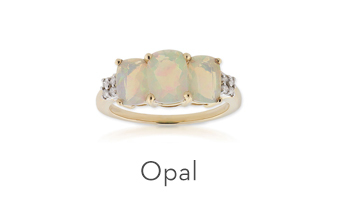 Opal value is based on the amount and distribution of their play of color. The industry ideal is when there are broad patterns that cover the stone's surface with all of the colors of the spectrum, but you may find that you prefer an opal that glows serenely with blues and greens. Or you may fall in love with an opal that flashes bright patterns of reds and yellows. Each opal is different, and individual taste is truly the best guide for choosing the right stone. Many people think of topaz as a blue gem, but that classic blue color is often actually caused by treatment given to colorless topaz. Topaz naturally occurs in brown as well as in various saturations of blue, yellow, orange, red, pink, and purple. Believed by many in India to assure long life, beauty, and intelligence when worn over the heart, topaz is a pleochroic stone, which means that it can show different colors when the light hits the crystal from different directions. 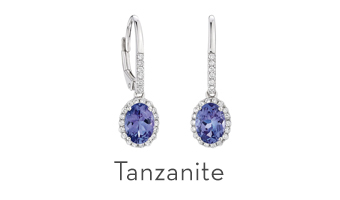 Tanzanite is only found in one place on the planet: in the Merelani Hills of Tanzania, which lie in the shadow of Mt. Kilimanjaro. Named for its country of origin, the velvety purple‐blue stone tends to be more expensive in instances when the color is more blue than purple. This value judgement is actually more scientific than aesthetic: the crystal tends to form with the blue color axis oriented along the width of the crystal instead of the length. This means that if the gem cutter chooses to maximize the purity of the blue color, it will result in a stone cut from the rough that is smaller than perhaps otherwise necessary but that also costs more per carat. 1Many gem details were adopted from the Gemological Institute of America’s Encyclopedia of Gems.